"A bite of this tangy noodle salad will help you feel fuller and satisfied longer, thanks to protein-packed canned chicken." Prepare noodle salad: Heat large saucepan of water to boiling. Add rice noodles; remove from heat. Soak, uncovered for 5 minutes. Drain and rinse in cold water. 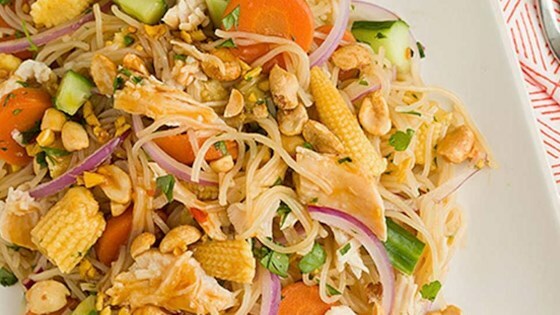 In large bowl combine noodles, baby corn, chicken, carrots, cucumber, red onion, cilantro, mint and peanuts. Prepare dressing: In small bowl combine sweet chili sauce, lime juice, soy sauce and ginger. Toss with noodle salad to mix well. Feel full and satisfied longer, thanks to this protein-packed noodle salad. i actually didn't like this and I love noodles of any kind. This sauce was too sweet and thick. threw most of it away. Very good recipe. I decided to make it as a hot meal as we found it more satisfying that way. Also, I suggest cutting back a little on the lime juice. Otherwise very tasty!! I made this recipe yesterday, and it was a success, so I therefore say it was Excellent. This is a fabulous dish that is quick, easy, and has excellent taste. Add chicken or shrimp for a perfect light meal. I'll will be making it again for an upcoming party this weekend.